If your vehicle was towed from public property contact Seibert’s Towing at (804) 233-5757, if your vehicle was towed from private property, call (804) 646-5100 and press option 1. Apologize for popping off but I’m still angry. If you think this was a wrongful towing you CAN contest it. A couple years ago I had my car towed on the wrong day by Seiberts. The “No Parking” sign said Thursday and they towed it on a Wednesday. I called the police and tried to get them to bring my car back bc it was obviously the wrong day, the sign was still there but I was told I would have to go to court. I ended having to get a friend to drive me to Southside where Seiberts is and had to pay Seiberts to get my car back. They didn’t care that I had pictures of the sign and reiterated I must go to court to get my money back. I had to go into city hall to sign up for traffic court which only happened one WED a month and I also had to take off work for that court session which ended up starting really late. And it literally took the judge a few seconds to determine I was wrongfully towed. I had a printed picture of the Thursday sign and that was all he needed. AND after all that I get one piece of paper I had to PHYSICALLY show Seiberts to get a reimbursement that took over a week to get back into my bank account. It’s absolutely ridiculous the hoops you have to go through. This was mostly inconvenient for me but is probably devastating for the less privileged. I had a friend with a car to drive me to Southside, I had a job that would let me take off, I had enough money to get my car back and was able to take care of all my bills/rent while waiting for reimbursement. And this isn’t just something that happens by accident. The judge was calling groups of people up by street name. He even made a comment that this particular tower is a little “heavy handed” in towing. Take pictures every time you park near one of those signs no matter what day it is!! Good advice. 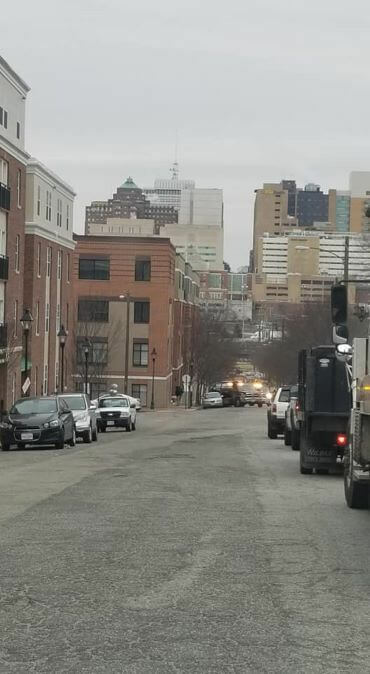 I know that cars were frequently towed behind The Siegel Center on Marshall Street when the city would post signs the day of intended towing, and not a few days before, causing many cars to be towed. It seems like quite a racket. Looks like this is the 1900 block of Marshall. 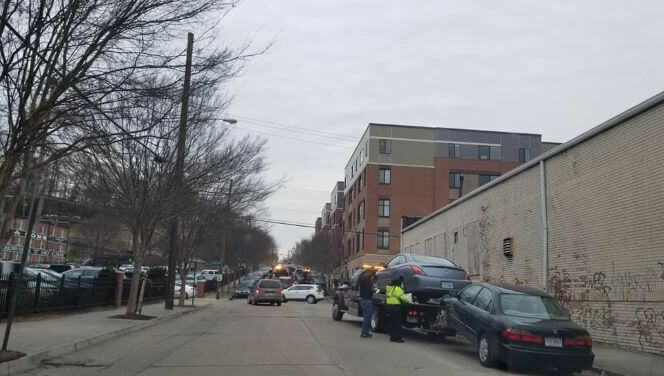 *Techically* the whole north side of that block is no parking (the Jefferson Park side). As more folks moving into the new building, I imagine they will continue to test their luck instead of parking under the building.